Get comprehensive Diving insurance with the Liveaboard Rider! 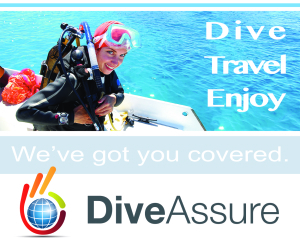 SINGLE DIVE TRIPS or ANNUAL INSURANCE PACKAGES are available via our partner - DiveAssure. They offer scuba divers a variety of superb Insurance and Assistance programs, in various levels, to cover all needs of both diving locally and when traveling overseas. Click on the banner below to sign up now. What is provided during the trip? Yes. All our tanks are DIN valve tanks with yoke adapters. For Singapore: No, please do arrange it yourself prior to departure. You may obtain it from DAN or our partner DiveAssure. For Phuket: insurance is included but only up to THB 200,000. We strongly advise divers to obtain insurance before any trips! Are there any forms of communication on board? The reception is only around Tioman, Aur, Redang and certain Similan Islands. We have satellite phone onboard that can do outcalls only. The usage charge is US$3 per min. Yes, all of our cabins have 220V universal sockets. Is there Emergency Oxygen onboard? Yes. Also, we have a well-maintained first aid box and sufficient oxygen for evacuation to the nearest medical facility. Do I need my passport to board your boats? Departing from Singapore: Yes please. We will be leaving the country and entering another country. Please ensure that your passport is valid (more than 6 months). Departing from Phuket: Your passport is not necessary unless it is a special expedition leaving Thailand. I only have an open water certification. Can I still join trips that are recommended for advanced divers? Yes, you may, but you will have to take an advanced course or adventure deep dive on the trip itself. Do you provide hotel or airport transfer? In Singapore: We are sorry but it is not provided. It is convenient to take a taxi and meet at the designated departure location. In Phuket: We will do hotel pick ups from 3pm to 8pm (dependent on your location). For airport pick ups, it would be at 6.30pm. For guests unable to make that timing, we can arrange for a private taxi and payment can be made directly to the driver. We would also do transfer to your hotels after the dive trip itself. Both services are included in the package. What can I do if I arrive in Phuket Airport on the morning of the sailing day? Or arrive only after 6.00pm (Phuket time)? If you arrive in the morning, you could make your way to Naiyang Beach area to rest and relax. We will arrange for the transfer to pick you up from the area at 6pm. If your flight arrival is only after 6.00pm, you will have to arrange for a private transfer to the pier at your own expense. You can request us to arrange the transfer for you too and make direct payment to the driver. I am unsure of my equipment sizing. Do you have sizing chart? Yes we do. Please see below for the sizing charts of our BCDs and wetsuits. What are the terms and conditions for booking / payment? Payment of a non refundable deposit (50% of full payment) must be made within 4 working days to secure your booking. Full Payment must be made 6 weeks prior to departure of trip. Guests will forfeit their full payment if the cancellation of their trip (due to any reason) is within 4 weeks of the departure date. There will be a compounding late payment interest of 1% of the total invoice amount each month. Guests are allowed to postpone their trip at a S$50 surcharge if they inform DiveRACE Pte Ltd at least 1 month before the date of departure. This is only allowed once. Guests must get insurance coverage prior to the trip. In the event that an individual fails to do so, he/she will have to bear the cost of evacuation and treatment if the need arises. DiveRACE Pte Ltd will not be held responsible for any forced majeure (eg. Acts of god, Bad weather conditions) which make it unsafe to sail. Guests are expected to arrive punctually as informed. DiveRACE Pte Ltd has the right to depart without the late guest(s) and without any refund of payment. Guests must sign the Assumption of Risk and Release of Liability Form or DiveRACE Pte Ltd reserves the right to prevent them from diving and/or participating in trips. Guests are to prepare and be responsible for their travel documents if necessary. This means a valid VISA with 6 months validity and sufficient pages in the passport, with any dive certification documents for verification. It is the responsibility of the hirer to inspect and acknowledge that the rental dive equipment provided by DiveRACE Pte Ltd is in good working condition. The hirer will also assume responsibility to reimburse DiveRACE Pte Ltd for any equipment loss or damage while under the care of the hirer. DiveRACE Pte Ltd reserves the right to make changes to the price, trip schedules and other matters pertaining to the company accordingly without prior notice.